Here are some games and activities that can be used for the elementary and middle school grade levels. In both instances , the information will include ideas for both small and large areas. Check back often for a list of games/activities that should be shared with the entire staff . Any time there is a question please send off an EMAIL to clarify or ask pertinent questions or revisions. The first entry was a game called , FLINGO , which was placed on the NASPE discussion group in the elemementary section. Also , there will be a podcast to accompany each game to explain the rules,etc. by way of an audio production. From there , you can save or download at your convenience. 5. A score is made passed the opponents endline. 8. A Flingo that goes over the sideline( out of bounds) is thrown from that spot with a free pass. 10.A flingo may be thrown to a teammate over the endline , but only after three throws. 3. Play two games at once on each side of the mid court line. Skill practice - with a partner - toss back and forth and after each catch move back one step . Place hula hoops on the floor and practice accuracy tosses like "horseshoes". Set up many pitches . Place 8-10 Flingos on the gym floor in a scattered position. On a signal , th epartners run to a Flingo and toss and catch three times. Put the Flingo on the floor and run to another new Flingo. How many Flingo can you throw and catch in one minute. Repeat for a better performance. 5. Receive the flingo , eyes on the Flingo , track it . if the Flingo is at a low level , put little fingers together. At a higher level , put thumbs together. INDIANA JONES : arrange the class into two concentric circles facing each other , ball width apart. Start the ball moving in a clockwise direction. Establish a time limit to see how many rotations the ball can make for 30 seconds. Repeat the process trying to better a previous attempt. INDIANA JONES II : Using the same arrangement , chose one person to run inisde the concentric circles while the rest of the class tries to hit the KIN BALL onto the runner. As an alternative try to have Indiana Jones catch up to the ball while the students attempt to keep it away(the ball) from being touched. KIN BALL KICK : Arrange two groups in a large circle with each team divided by a semi circle. At two points make traffic cones to show which groups are on teams. The object is to kick the ball ove rthe heads and onto the floor of the opposite team. But, make sure there are two "catchers" who can catch the ball before it hits the floor. Kickers must stay in place , wirh their hands on the floor. Chose new catchers every 30 seconds. KIN B_ BALL : Place two teams , with one playing on the floor area and one on the sideline. The object is to manuever the ball towards the other team basketball hoop. Any ball that touches the floor goes to the other team. At that point , the ball is served or pushed upward to a teammate. Once the ball is manuevered correctly down the floor , the object is to hit the opposing teams backboard. But , if the ball is caught , off the backbaord) , by the opposing team , negates the score. The ball is propelled by a push or serve and no running with the ball permitted. The sideline gets errant tosses and serves it back to a teammate. Switch positions often. The best case scenario would be to have two games at once on a half court . KIN BALL GAME : Teams are arranged in groups of five throughout the area. They don't have to be close together. The game starts with a serve with four memebrs of one team holding the kinball high overhead. The server bends down and pushes the ball out of their hands. Each team is given a color. When the ball is served , he/she calls out a color. A member of that team must catch the ball before it hits the floor. If caught that team surrounds into a circle position and repeats the process. This is why all team members must be scattered because he ball may be propelled anywhere on the floor. The ball may not go out of bounds or hit the ceiling. This is an error. The team that lets the ball hit the floor doesn't score , while all others receive one point. The serve must be in an upward arc and the color called before serving.No color can be called twice in a row. This is an easy activity to set up and there are many alternatives to make it more appropriate for each grade level . First ,place traffic cones to make lanes for the games. This will make up to twelve courts with a variety of players at each court /lane /game. It can be two on two , three on three or more. If the ball lands on the floor and in between the side cones/lanes , then it is a score. If the ball is caught, then its an out. After three(3) OUTS there is a switch of teams from offense and defense . Throw the ball off the wall above the bleachers or a mark on the wall. Note : The cones are parallel to each other about 15 feet apart. Also , you may establish a round robin set up and exchange courts to play different players . Heart Attack - hand out red pinnies to one group . The other groups must flee from the Heart Attackers , who try to tag them. When tagged , that person must balance on one foot and spell ( HEART ) before re-entering the game. But, at the same time, that person must run with one finger to depict a mild heart attack. Three heart attacks means they must be defribbed and that means moving to the sideline and administer a makeshift defribber,which then promotes a return to the game . After a designated time limit , change heart attackers until all had a turn. This is also a great time to mention the defribber and what it does and why? Where is it located in the school? Call 911 ? At the point when there is most activity , ask them to find their pulse , count the heart beats,(boom,boom). Valentine Cards- give each student a different Valentine greeting that is found on the small candies at this time of year. The greeting is placed on an index card . Make 5-6 different greetings. ( Be mine , hugs, U.R. nice, U.R. sweet ,etc.) Call out one greeting to chase the other ones. If tagged , that person stops at that spot ,and waits for anybody else to set them free, which is a HEART stomping arrangement by both students. ( they spell out HEART/VALENTINE as they stomp their feet at the same time. This will free that person to re-enter the game.Call new taggers each time . Give points for tagging, never tagged and how many times they set somebody free. As an alternative : Change the size of the space , the type of locomotion, and place an exercise on the card to perform if tagged. Rotate to the next hole( 1-2-3-4-5-6-7-8-9-1) . Make sure to have enough appropriate equipment . Add more chairs for chair shot . Place scorecards with names in a safe area( with pencils). Place score per hole , then switch on command . If waiting when done , practice dribbling or passing skills. This will be a math integration , percentages and addition skills, and teamwork/cooperation . Fore ! Be creative , make up different tasks per hole . Tennis Ball Run. The students are lined up side by side on a contact line with one tennis ball . Number or letter each ball according to the ability level of each grade. Use a marker that is smudge – proof for future activities. On a signal , the students roll the ball into the gym area . They will have to find their letter or number and return to the starting position, which is the end line of the basketball court. Call out times as each student crosses the starting line. Repeat to beat a previous score . Alternatives : Challenge the students to find their numbered or lettered ball and return in numerical or alphabetical order. Repeat for a better score . Use the lettered balls to spell out names relevant to physical education ,spelling lists , computer games or media entertainment, such as movies, TV shows and cartoons. Give a point total for each word or math addition score. This fosters cooperation and decision making skills. Change the positions of rolling the ball ( backwards, between legs ). Freezemania . This is a partner activity in self space , which will lend itself later to free space, so it’s important to discuss and practice pathways . The partners are facing each other in exercise lines , in file formation , about 5-6 feet apart . Play music to start the activity . At that signal , the students hand tennis the ball back and forth until the music stops. The student(s) , who last touched the ball must chase/tag their partner before a ten second time limit. The play resumes with the next musical selection . They will start the next turn from where the last run and chase stopped. This will open the activity to provide more safety . Alternative - Instead of being tagged ,practice mirroring , which the chasing student must stay within an arm’s length away when the time limit expires. Change partners for more variety. ( make sure the last student that touched the ball carries it for the next turn). EARTH BALLArrange the class into a square formation in which each student has a safe object to throw at a Kin Ball or large beachball , which is designated as the Earth . On a signal , the students throw at the Kin Ball to try to move the ball to the three opposite garbage dumps , which is the starting throwing line of each group.If the ball goes over their start line , then the instructor empties out a large garbage can of paper wad balls . That group has 30 seconds to return the garbage to the container to save the Earth from destruction . Repeat the process and each group will try to have the least number of garbage disposals. Garbage Pull Arrange the class with partners at a desgnated starting line . Place an old tire , bike tire or tube between them , which they will grasp at each end or designated safe area. Make another line about 5-8 feet away from the starting line on each side . Next, place a paper wad ball or deck ring on the floor . On a signal , the partners will try to pull the partner toward the deck ring and at the same time pick it up . At that point , score one point per pick up to save the Earth from unsightly materials . Change partners each time . The two groups are in paralell positions , chose one student from one group to go to the their other end , and everybody moves up one slot to get a new partner. Count he number of garbage for each group . Place deck rings at designated spots . The first person picks up the rings and puts them in a container , the next person puts them back and repeat the process . Push a large carboard box or" garbage can" back and forth . Use a scooterboard to propel the garbage can . Throw and catch a dryer sheet at least three times back and forth . Alternatives can be paper wad balls or rip flags ,etc. or whatever equipment is avaialable. Place milk cartons or two liter soda /pop containers in a straight line about 3 feet apart. The first person tips them over and runs back , while the next person picks them up . Time the class how long it takes to complete the Earth clean up . Change lines each time so all get a turn and then repeat to better the score the next time. 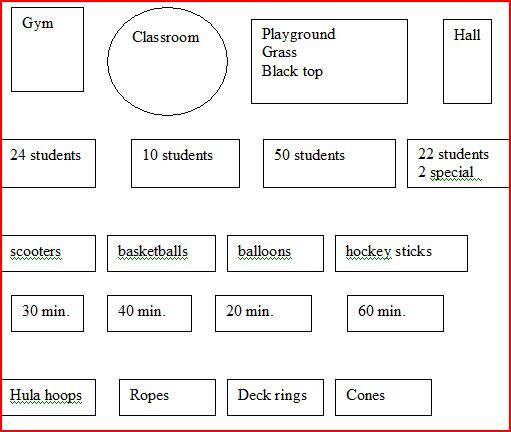 Culminating ActivityArrange the class into a square formation . Dump out all the equipment , which will be scattered in the center area. On a signal , one object must be picked up and returned into a designated container behind each group . As an alternative , two partners go at once in that there is a game jersey held between the two . Time the class how long it takes to complete the Earth Day clean up . Repeat for a better score. It must be noted that during the activity to mention that some of these objects need to be placed in the proper containers as seen on many roadways . This would be a great time to mention that volunteering is a great way to help keep America clean . Also, use materials during the activities from some of the core teachers or art teacher to involve them in the Earth Day festivities. Each category has four choices . * Choose one situation from each box . * Add the rules and any adjustments or modifications. * Here is an example , but not the possibilities as its your mission . * No choice can be used more than once . Good luck ! Example : Classroom ….24 students….scooters….40 minutes…. and there are deck rings . a) SHOULDER TOUCHES - Get into a push-up or modified push-up position. On the word go (or when the music starts), touch your right hand to your left shoulder, and your left hand to your right shoulder. How many can you do in 10 seconds? b) THE CRAB - Get in a crab walk position. Touch your right shoulder with your left hand and your right shoulder with your left hand, alternately. How many can you do in 10 seconds? c) PUSH -UP SQUASH - Place a 1/2 ball or small playground ball below your chest. Make it squash each time you do a push up. How many can you do in 10 seconds? d) JUGGLING A NUGGET! Get into one of the two push-up positions with a tennis ball or a small beanbag between your hands. When the music begins, take the ball with the right hand and place it under your chin. Take the ball from your chin with your left hand and replace it to the floor. Continue the activity for 30 seconds and count the number of time that the ball is held under your chin. How many other kinds of exercises can you do with the ball? A bean bag can also be used. a) LOW FIVES - get in a push-up position or modified push-up facing your partner. How many times can you give one another a low five in 15 seconds? b) HIGH FIVES- Get in a push-up position or modified push-up position facing your partner. Touch one another's opposite shoulders with your fingers. How many can you do in 15 seconds? c) SPIDER HOCKEY- Partners face each other in a push-up position, approximately 12 feet apart. Try to throw a Spider Ball or beanbag through the arms of the other person. d) MUSICAL PUSH-UPS - Partners face each other in a push-up position with a ball between them. When the music starts, start giving each other high fives. When the music stops, each player tries to get the ball before his/her partner does. Play 2 out of 3! Variation - Partners face each other and the teacher begins to name body parts, i.e., nose, thigh, head, cheek, etc. When the teacher says ball, the participants attempt to see who can grab the ball! e) MOVING THOSE NUGGETS - One student is in a push-up position and the other is standing at his/her feet. The standing partner rolls a ball on the ground to the right of the person, who in turn catches it, transfers it to his left hand and rolls it back to his partner. Continue for 30 seconds and count the number of times the ball is circulated in a 30 second period. Give the participants a ten second reprieve so that they can exchange places and then repeat the activity. The score of both of the players are added up and recorded. These activities camouflage the drudgery of doing push-ups and since they are fun to do and every student can find their own level of success, students are more likely to practice them and in doing so, improve their upper arm strength. Debrief this activity by sharing with the students the importance of having upper arm strength and the role it plays in their daily lives, inside and out of the realm of sport activities.